The Predators and the Prey by S.Ravynheart. In the urban fantasy world of The Sidhe, the fey have always been hunted for their blood and magic. Their bodies are partly physical and partly magical. It’s this magic that makes them so desirable. Blood drinkers, such as vampires, crave fey blood for the intoxicating rush. Less experienced vampires can turn feral at the merest taste of premium Sidhe blood, shredding anything and anyone that gets between them and their prey. Because the scent of the fey is so distinct, a vampire can sense their presence within a crowded room even when the fey is using Glamour to disguise his appearance. Despite the grace of the fey which makes them slippery to catch, vampires have superior strength and speed. Vampires are not the only ones with a craving for the fey. Certain types of humans hunt them as well. The most treacherous are the wizards, who view the fey not as fellow sentient beings, but as animals to be exploited. Wizards have discovered that the innate magic of the fey could be extracted and used for ingredients in potions and spellcraft. No part of the fey’s body would go to waste. It was because of the irredeemable brutality of the wizards that the Sidhe drove them from Ireland. Wizards are not the only humans which pose a danger. The noble elves known as the Sidhe are the only race of fey which possesses the magic of the Touch. Among the Sidhe, the Touch is a natural and bonding experience in which the Sidhe share their magic with each other. To a human the Sidhe Touch is a devastatingly pleasurable experience that fundamentally alters them. While the magic exists with their body, the Touched human feels the glorious power of it. This magic slowly fades over the course of several weeks, leaving the human craving the magic. This craving transforms into an agonizing ache that can shred their sanity. The only relief is the frequent replenishment of the Touch magic. Because the Sidhe are scarce, and very few of them would voluntarily Touch a human, an addicted human may hunt for an unwilling Sidhe to force into sharing their magic. The greatest weakness for the fey is their sensitivity to silver. When silver is placed against their skin it prevents them from performing any magic at all. Silver also causes a slow and painful chemical burn. Certain magical wards can also prevent a fey from using magic. While the fey are highly desired and have certain weaknesses, they are not without defenses. Most fey have the ability to teleport short distances and can use Glamour for disguise. They have grace and speed which makes them solid fighters and difficult to snare. The Sidhe each possess a unique magical ability, such as control over fire, the earth, or shadows. In the wake of the disaster which has nearly caused the extinction of the Sidhe, one man is committed to defending his people from the predators. 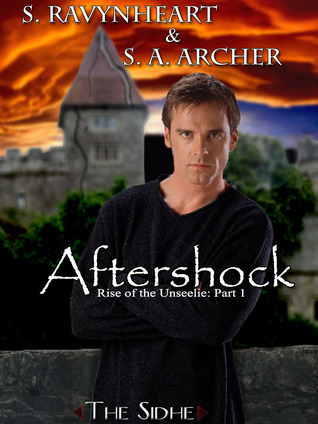 In Aftershock (Rise of the Unseelie #1) Donovan tracks down the new generation of Unseelie Sidhe who have been neglected, untrained, and unprotected by their exiled parents. Though he is determined to protect the young Sidhe with his life, the predators are circling ever closer. Enter below to win an e-copy of Aftershock! Witches and Vampires - can't choose! Thanks for the giveaway! Can i select all of them? I would have to say vampires.